With it's fiery good looks, this Red 24" LED 12V Strip Light is sure to make a red hot impression on your fellow LAN Partygoers. Thanks to it's flexible design, this Logisys 12V LED Strip Light offers unobstructed freedom for the computer lighting professional who wants to put their creative juices to the test. 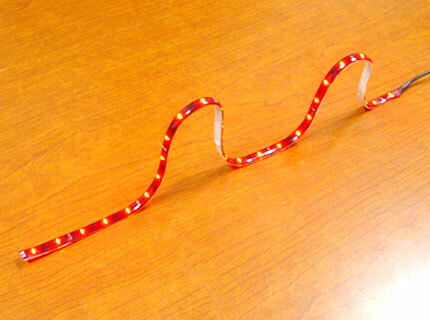 The workable nature of this Red LED light enables the user to attach it to any curved surface. The LED lights featured on the strip are covered by a protective silicon layer, making the strip able to withstand a great amount of strain without tearing or breaking. In addition, it's also weather resistant and water proof...not that we recommend dumping liquids anywhere on or near your PC. Note to Modders: A 24" LED strip can be cut at every 3rd LED bulb per internal counting from the power source. So if the bulbs happen to have an odd number after you've divided it by 3, cut the odd number first, then begin to cut in set of 3. Get it? Got it? Good.